Bridal lehenga is one of the popular bridal wears flaunted by women in the North India. Besides sarees, the lehengas are one of the most widely used traditional attires in India. Today the lehenga cholis have become so popular with a perfect blend of traditional and contemporary styles. Nowadays most of the brides prefer to wear designer bridal lehenga which helps to highlight their features in a better way. Lehenga cholis comprise of a long flowing skirt, a short blouse which is known as a choli and a dupatta which is worn over the shoulder. Lehengas are of different types and designs. The most common varieties include the A line, Fish tail, Full flare lehenga and the Mermaid. Each variety has a different shape. In the early days, the lehengas were worn by the royal Mughals and later on it became the traditional wear of the people of Rajasthan and Gujarat. Further with the advent of latest trends and designs, there was a substantial change in the patterns and varieties of the lehenga cholis. Today bridal lehenga is chosen over traditional Banarasi sarees by the Indian brides. There is an exclusive variety of lehengas in the online stores too. The fish tail lehenga is tight and hugs the body till the knees and then it flows out. The A line lehenga is quite popular as it is tight at the waist and then flows out till the ankle just like an A. It is one of the most popular bridal wear. Bridal lehenga consists of rich fabric, most commonly silk and brocade, luxurious embellishments like mirror work, heavy embroidery, zari work and so forth. 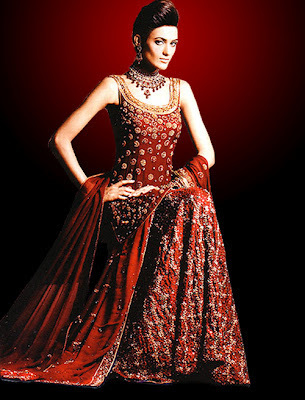 For occasions like weddings, women prefer heavily embroidered bridal lehenga which is made of silk. Matching dupattas made of silk is also preferred by most of the brides. The lehengas worn by brides are made of rich satin which gives it an ultra shine and appear exquisite and elegant. Crape, georgette, tissue and net are the other commonly used fabrics for lehengas. The Sharara and Lancha are the two different varieties of bridal lehenga. 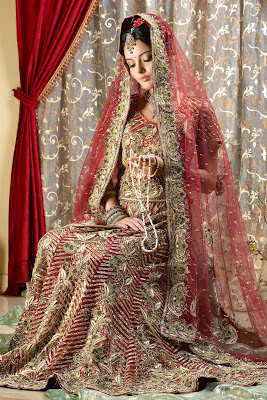 Sharara is commonly worn by Muslim brides and its choli is longer than the usual one covering the hips. The Lancha is tantamount to the traditional lehenga but its choli is a bit smaller and shows the midriff. The most popular colors of the bridal lehenga includes shades of red and maroon but now different colors are being incorporated and used like blue, orange, green. Dual colors are also quite popular these days. A number of designer wear lehengas incorporate different patterns and contemporary styles to give a unique look to the lehengas. Silver and golden embroideries add to the beauty of the lehenga. Designer lehengas are available at different rates in the online stores. You can easily purchase them at affordable rates by comparing the prices offered by different companies. The bridal lehenga choli is known to enhance the beauty of the bride by giving her a royal appearance. Every bridal have a dream to look beautiful on her wedding also like to wear stylish wedding dress this is the super collection of wedding for bridal. Your collection Awesome. I like your collection. Its one of the gorgeous looking wedding dress is here and everyone will get attracted towards the same as well. i really liked the same here . All lehenga choli collections is really awesome. i really like it. you can find latest online designer lehenga choli collections from G3 fashions surat.